A loud voice at the massive rally of people from across Khasi and Jaiñtia hills of Meghalaya resonated on Thursday against the Citizenship Amendment Bill (CAB). At the rally, the Meghalaya Democratic Alliance (MDA) government was asked by the leaders to immediately implement the Inner Line Permit (ILP) to curb influx problem. The rally, joined by over 40,000 people, also saw participation of leaders from various political parties. The rally was organized by 14 organisations under the umbrella of Confederation of Hynñiewtrep Social Organizations (CoHSO) at Students’ Field, Jaïaw here. At the rally, chief executive member of the Khasi Hills Autonomous District Council (KHADC), H.S. Shylla hit out at the NPP-led MDA government for not pushing Bills passed by the Council including a regulation related to the implementation of ILP. Shylla announced that he has resigned from the National People’s Party (NPP) and served a one-week ultimatum to the state government to implement the ILP and get the assent of the Meghalaya Governor to all the Bills passed by the Council. CoHSO chairman Robertjune Kharjahrin also announced the resolution “no CAB, yes ILP” at the rally as thousands of people raised their voice in unison. Shylla said that the only way to protect the indigenous people is ILP because the BJP-led NDA government is determined to implement the CAB. United Democratic Front (UDP) leader and former minister Paul Lyngdoh also said if the NDA government would implement the Bill, this issue should be taken up at the international level by seeking the intervention of the Union Nations. Representatives from various organisations and political parties also spoke in one voice opposing the Bill and demanding implementation of ILP to prevent influx of illegal immigrants and outsiders into the state. 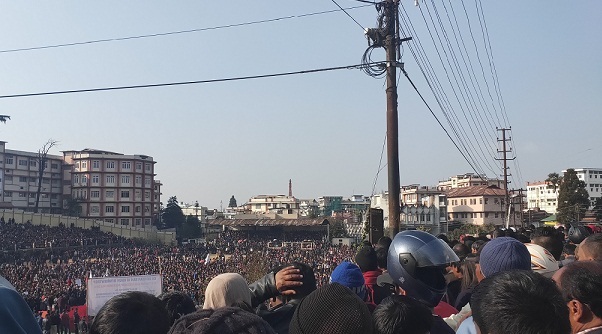 The rally began with a huge procession from Jaïaw Lumpyllon to Students’ Field and the crowds shouted slogans against the NDA government for its move to implement the CAB and demanded from the Meghalaya government to waste no time, but implement ILP immediately.